Tell the kids it's not what they think. 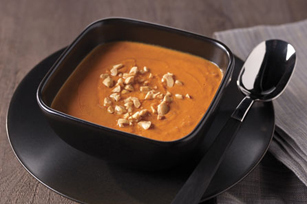 This savoury peanut butter soup is a Thai-style dish made with garlic, onions and tomatoes. And it is awesome. Cook and stir onions and garlic in hot oil in large saucepan on medium heat 5 min. Add tomatoes, water, broth and vegetables; simmer on medium-low heat 25 min. or until vegetables are tender, stirring occasionally. Add remaining ingredients; stir until blended. Cool slightly. Blend soup, in batches if necessary, in blender until smooth. Return to saucepan. Cook 5 min. until heated through, stirring frequently. This soup is traditionally made with berbere, an Ethopian spice blend. If you want to use berbere, omit the chili powder and ground allspice and use 1/4 tsp. berbere instead. Top with chopped peanuts or sliced green onions just before serving.